Barbecue cooking tends to be quick, so this joint is pre-cooked for a meltingly tender texture and rich flavour, before being placed on the barbecue to crisp up and achieve that characteristic smoky flavour. Preheat the oven to 180°C, gas mark 4. Cut and discard the string from the pork then, using a sharp knife, remove and reserve the rind, leaving a layer of fat. Turn the joint over and cut down the middle, but not all the way through, so that the joint opens out into 1 flattish piece. Place in a roasting tin. In a small bowl, mix all the spices, thyme, lemon zest and juice and the olive oil. Season well. Using your fingers, rub this mixture all over the pork. Cover tightly with foil and cook in the oven for 1 hour 45 minutes, until the pork is thoroughly cooked, tender and the juices run clear. Meanwhile, cut the sweet potatoes into thick wedges and mix in a bowl with the vegetable oil, cayenne and seasoning. Place on the edge of the barbecue and cook for 20-25 minutes until tender, turning occasionally. Carefully remove the pork from the tin using tongs or a pair of carving forks, reserving any juices for basting, and place on the hot barbecue. Cook for a further 10-15 minutes, turning halfway through and basting with the juices until the fat is crisp. If you like crackling, once the meat has been removed from the oven, increase the temperature to 220°C, gas mark 7, rub the reserved rind with a little oil and salt and place on a rack over a tray. Roast for 30 minutes, or until crisp. 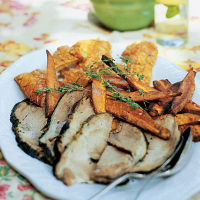 Serve the pork in slices with pieces of crackling and sweet potato chips. Alternatively, cook the pork up to the end of Step 4 then finish under a preheated medium grill, basting and turning occasionally until the fat is crisp.